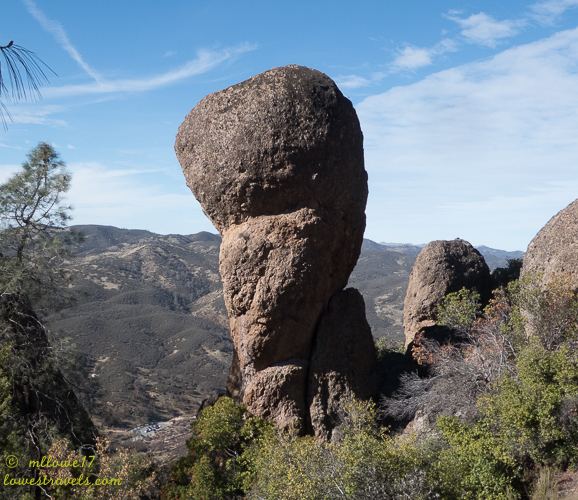 This is the first in a series of three posts about California’s remarkable rocks that we explored in January as we headed south to Arizona. After checking out this amazing parks we realized these rocks are as spectacular in their own way as the “mighty five” National Parks in southern Utah that we visited last year. 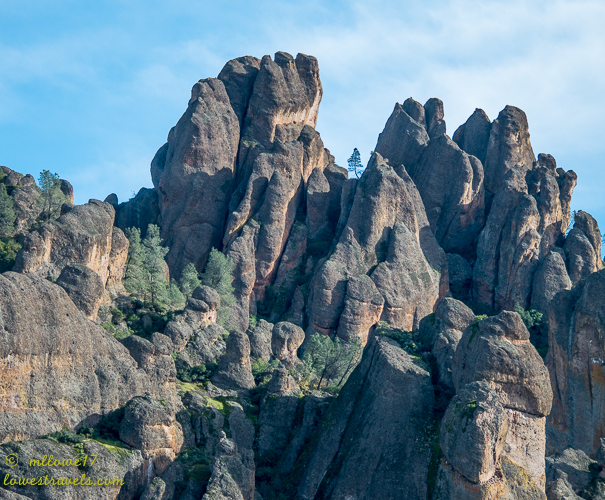 We visited Pinnacles National Park, the 9th N.P. in California (making it the state with the most national parks), and the 59th in the U.S. It was just four years ago in 2013 that the park was elevated from a national monument to a national park. It’s about 150 miles south of San Francisco and 55 miles east of Monterey. There are two entrances, one from the east and one from the west, and the internal road does not pass through the park so folks must pick the entrance they want to use for their visit. We camped on the west side of the park in Soledad and checked out the park from there. 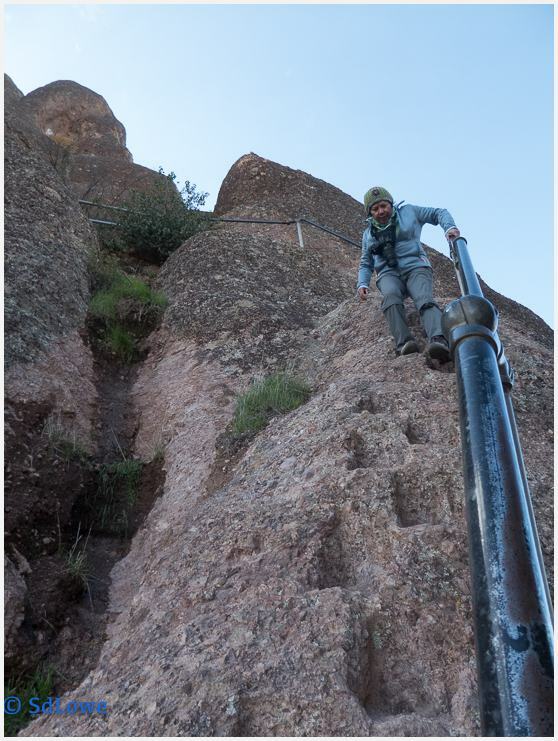 The following day the rocky spires and pinnacles were revealed! With only one day of sunny weather predicted, we followed the High Peaks Trail starting from the west side. 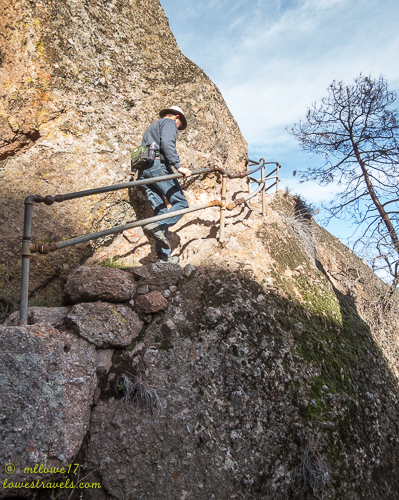 It crossed streams and climbed around and through the park’s namesake rock spires in several places, using rock stairs to allow the ascent along the sides of the pinnacles. 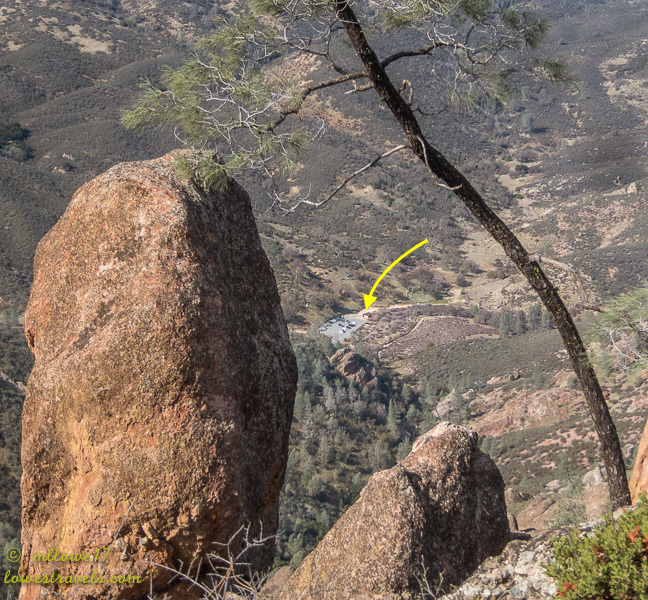 We saw the eroded leftovers of multiple volcanoes that had erupted, flowed, and slid some 23 million years ago to form what is now Pinnacles National Park. The High Peaks area covered in rock spires and the equally impressive views at the top made the park a unique landscape. 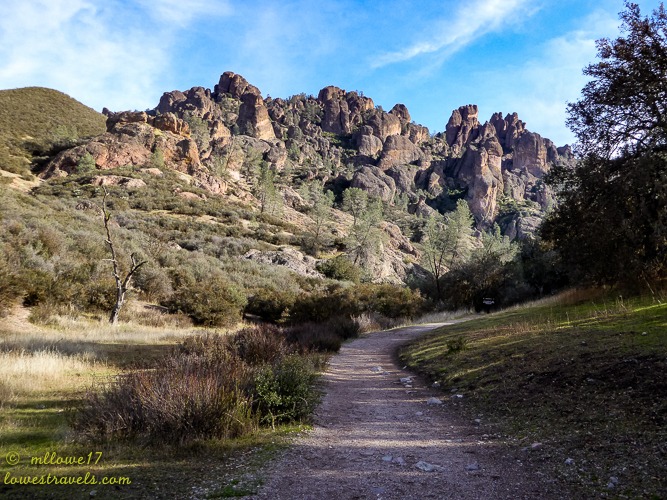 Pinnacles National Park is a hidden gem, and despite being only a 2-hour drive from our former home in Tracy, we never made it there. Then Eric and Laurel of Raven and Chickadee paved the way for us to discover and enjoy this wonderful place. If you happen to be in the Monterey/Salinas area, be sure to drive up into the hills and see this great spot for yourself. 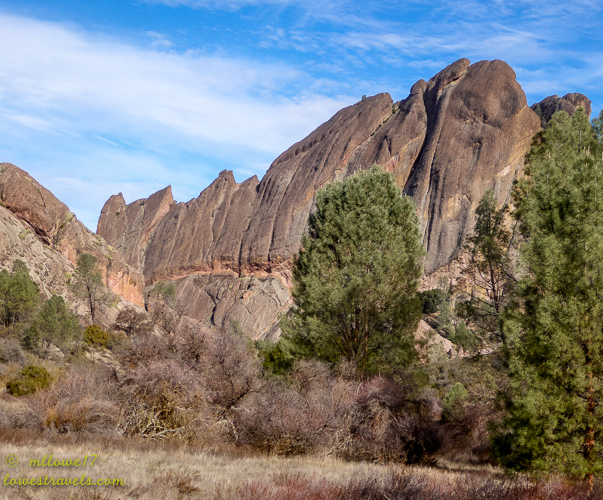 I’m embarrassed to say that we now are CA residents and have yet to get to Pinnacles NP. Great photos MonaLiza! Central coast is great part of California also. The 101 is so much nicer than Interstate 5 or 95. 395 on the eastern slope of Sierra is great too. When you get to Ventura you can bypass the LA traffic by going on the 136 east. We go to I 5 north and pick up 138 east to the 14 and across at Mojave to Barstow (Interstate 15 to 40 east) never touch LA traffic. I was just checking this out in a guidebook yesterday as a possible place to stop — what serendipity! Where did you stay while here? We prefer to avoid LA and SF so tend to stay toward the central part of CA, but maybe a spur trip out to Pinnacles would be worth it. Thanks for a great post! 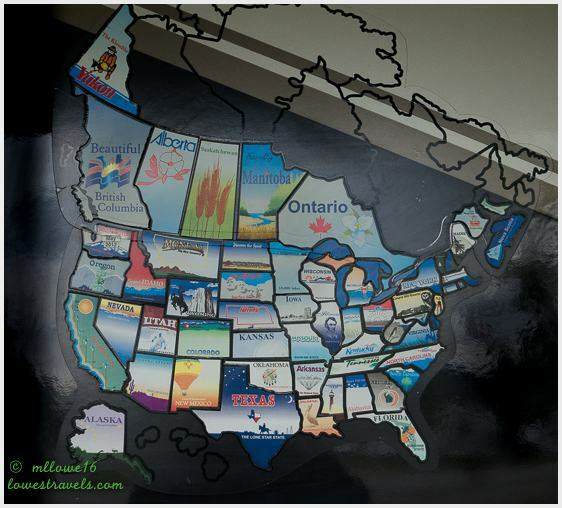 We stayed at Yanks RV Resort in Greenfield, CA which is only about 20 miles from the west entrance of the park. Springtime is one of the best time to visit due to all the wildflowers blooming. Also you can do wine tasting after your visit to the park. Wow, those chiseled stairs look interesting! So glad you guys made it to Pinnacles! 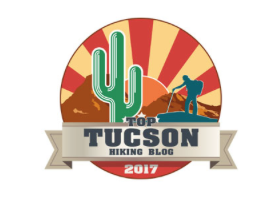 We also really enjoyed the High Peaks trail, although we were hoping to see the famous condors sailing overhead and only saw Turkey Vultures. But it was a great hike, nonetheless! I’m looking forward to your post on Red Rock Canyon—that’s a new one for us. 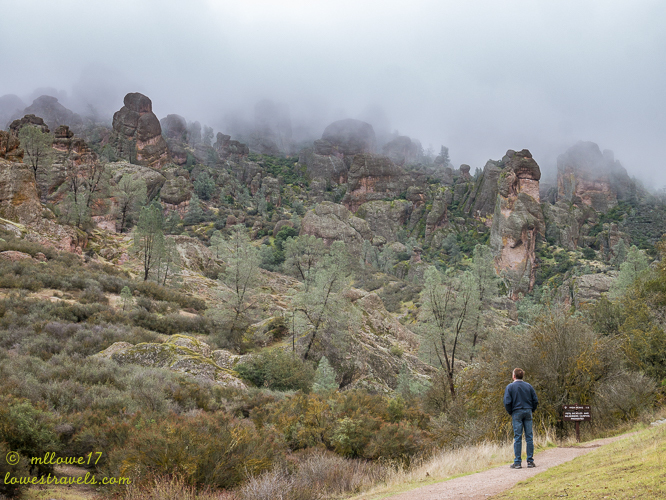 Your photo of the pinnacles in the mist is magical. This is great Mona Liza. Looks like fabulous hiking. Your pictures are terrific. I didn’t realize it had been “upgraded” to a National Park. Sure hope Congress can’t do anything about that since rumor has it they want to turn all the public’s lands over to development. Looks like a cool place! I love the lone tree on top of the rocks in the 2nd photo. That’s a beautiful park, we visited it before RVing. Thanks for posting this, MonaLiza! Friends recently took this trail and loved it. Now I see why!